One for you Ocean Sailors. If you are planning to visit the London Boat Show at the ExCel Centre, taking place from 9th to 18th January 2015 then MailASail Satellite Communications may be well worth a visit. They will be exhibiting on stand A056 and featuring their new Red Box router as part of an interactive display for the duration of the show. Their teleport-it compression technologies helps keep the cost of Sat comms down. The router also takes a 3G dongle. 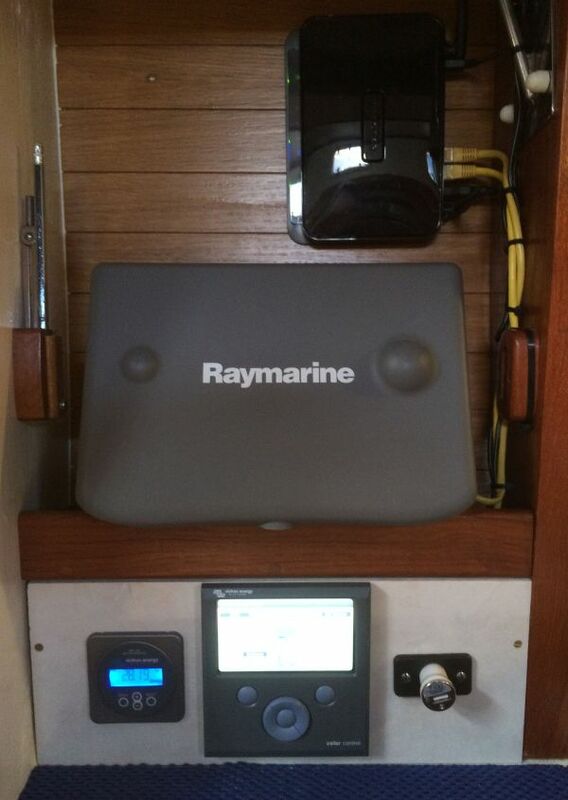 Update May 12th 2014: the 3G router solution, as explained in this blogpost, works very well. Many of our customers are using it already. Making the VGR2 or any other USB mobile broadband dongle work 100% stable is a lot of work. We have therefore decided to postpone the ‘support USB mobile broadband dongles’ project. This allows us to focus on other things first, for example Wifi dongle support, Remote VEConfigure and improving the overviews. For the grid connected amongst you, with land based broadband who run a CCGX and use the VRM Portal – it is easy to connect the CCGX, so it talks, to the VRM Portal and uploads your data. It’s simply a question of plugging an ethernet cable into a spare port on your broadband router and then into the CCGX. The router will automatically allocate the CCGX a local IP address on your home/business network. Obviously you need to check on your CCGX, that logging is enabled and that an IP address has been allocated. It will likely be in the 192.168.*. * range. Assuming you have set up a VRM account correctly, then the Victron equipment connected to your CCGX will send and log that data via your broadband router to the VRM site. So what about us off-grid types? As the CCGX runs a fast, lighweight flavour of the Linux operating system, most any USB mobile broadband dongle can be made to work with it. Therein lies the rub as they say. ‘Can’ is the key word here, as USB 3G/4G Modem support is still being worked on for the CCGX, by the Victron team. Personally I wanted to get something up and running now, in my excitement, to get things talking to each other. In that case an equally capable solution (with in fact even more options) is to use an off the shelf 3G/4G router with compatible SIM card or USB mobile broadband dongle. This solution might not be for all, based on feedback received on the blog. This suggests customers, with installations having small battery systems, may want the lowest possible power use and so prefer to fit a USB mobile broadband dongle, that is recognised by and fits direct into the CCGX. Others in poor reception areas might be looking for a router with a detachable 4G LTE / 3G antenna, that can be replaced with a high gain antenna solution. Based on this, these matters are being considered by the developers at Victron with the possibility of a Victron branded solution with much faster speeds than those offered by the current Victron GSM/GPRS, Global/Ethernet Remote products. Personally I’d like to see a USB mobile broadband dongle with MiFi solution, that plugs direct into the CCGX. Having said all that and regardless of speed, off-grid solutions clearly fall into two categories. Those within mobile signal range and those that are not. For those that aren’t – low earth orbit satellite technology such as Thuraya might be a solution or failing that a worldwide geo stationery satellite broadband solution. Coming back to earth however, most of us will be in mobile signal range and will be one of three types of user. Here are a few examples of off-grid Victron end users. Off-Grid Land – Sam Wiltzius and his off-grid cabin in Michigan. Off-Grid Boat – My own sailing yacht Elektra. Off-Grid Motorhome/RV – The virtual RV home of TechNomads Chris Dunphy & Cherie Ve Ard. As I sail mostly around the coast, within mobile phone range, here is my setup. In my research I came across three makes of router, suitable for my needs. Which one or indeed any similar that you may choose will depend on your location and requirements. As I’m familiar with Netgear and D-Link I looked at them first. Unless you need higher speeds than 3G or 3G+ I’d stick with that in terms of cost. Personally I chose an end of line MBRN3000 NETGEAR 3G+ Mobile Broadband Wireless-N Router as the USB dongle I had was listed as a compatible modem. Here is a worldwide list of of currently supported 3G+ USB modem products for that router. Instead of that you use a fully formed web address, from a remote computer, that stays the same. e.g. http://MyOffGridSolution.dyndns-remote.com and the router automatically updates the dynamic IP on the fly, if it loses a connection and auto reconnects with a different dynamic IP. This Dynamic DNS support solution lets you use a normal URL, with a domain name as indicated, from anywhere. Check the router specs if you require this functionality, before you buy. You can create a free D-Link account here. After that you can go to Dyn.com and log in with those credentials, to administer and add a free host. I also liked the fact the Netgear router accepts a 12V power supply. Out of interest and if concerned about power usage – two BMV monitors with back lights always on at default intensity, the CCGX online, Netgear 3G+ and Wireless router running at 12V with a USB mobile broadband dongle plugged in – the consumption is 13 watts. When the Wi-Fi is turned off and the CCGX backlight goes off, it is slightly less. If you are looking for a mobile broadband SIM free dongle that often works with any provider i.e it is not ISP specific, then these products may suit. Here is an example for Brazil. You’ll note that it refers to a 3G HSPA+ USB Adapter MA260 Try searching on your own country and see if their is a non specific one or indeed a compatible USB modem that you may already have. For those that want more speed, here is the D-Link 4G LTE Router DWR-921, that simply requires a SIM card without a separate USB modem. It also has two detachable 4G LTE / 3G antennas, so there may well be the possibility of fitting a high gain antenna. Doing things this way, not only do you get a reliable off-grid connection from CCGX to VRM but you also have a local wireless network for your other internet needs. For my own needs I simply bought a second SIM, sharing it with my mobile phone data plan. Postscript 2016. I eventually ended up with the D-Link router mentioned above, as it saved messing around with dongles and has a simple SIM card insertion into the router. It accepts 12V too, has been 100% reliable especially with robust auto reconnect. We welcome your comments and any additional or your own experiences suggestions to this post in Disqus below.